Waterbury Clock Co. porcelain clock, "Parlor No. 100", ca 1889. 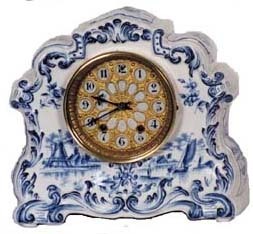 Dutch blue and white style case is 10 inches wide and 9 1/2 inches high.8 day movement strikes half hours on a gong. Full label on the back, decorative dial. Identical to the clock shown in Ly-Waterbury No.2056.